Agricultural products pumps. Simple, safe & accurate transfer of chemicals from drums, to tanks, to sprayers & barrels. Portable & barrel mounted 115 Volt & 12 DC pump systems. Suitability for the application should be determined by actual use and is the full responsibility of the customer. No warranty, expressed or implied, can be extended by Pacer where failure is caused by chemical attack on pump materials. Temperature, aeration, concentration, and other factors may change the effect of the specific fluid on the pump materials. Data shown is based on the results at ambient temperatures, unless otherwise noted. Pacer Plastic Piston Drum Pump - For Agricultural Chemicals # HPN-1A. Piston type polyester barrel pump for water & agricultural chemical applications. For liquids up to 2000 SSU (about the "thickness" of SAE 30 motor oil). 1 quart on every complete forward and backward cycle. Suction lift tested for 15 feet minimum. 3/4" X 8' EPDM, with polyester elbow and nozzle. Not for use with gasoline. Pacer corrosion resistant gasoline engine driven self priming 2" and 3" plastic water pump with gasoline engines. Suitable for water (clean or dirty) and many agricultural chemicals, such as Nitrogen, Roundup, Atrazine and many other chemicals. Self-priming to 20 feet. MP Pumps Chemflo 1,2,3 & 4, 316 SS Centrifugal Pumps. Investment cast, 316SS is stronger than stamped/formed 304, offering more corrosion resistance than 304, increasing service life and application flexibility, plus Chemflo protects against extreme pH and temperature. Viton shaft seals for continuous duty. 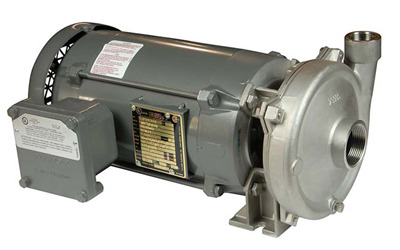 Require 56C face electric motors. Available in 1-1/2"x1" and 2"x1-1/2" NPT. MP Pumps Flomax 8, 2" NPT Flomax self priming centrifugal pumps. Up to 140 GPM, up to 40 PSI (92'), 3450 RPM. Available in cast iron, all bronze and 316 SS construction. Close coupled, long coupled and in PumPaks less motors. The FRX50, FRX75, FRX75-SP and FRX100 are a high performance stainless steel pump making it ideal for marine, commercial, or industrial transfer application of compatible fluids. Available in 1/2", 3/4", and 1" NPT Ports. All pumping parts are 316SS for superior corrosion resistance when pumping chemical compounds. PEDROLLO HF Series centrifugal pumps with mechanical seal, cast iron body with stainless steel motor shaft. They are ideal for agricultural and industrial application. Great for irrigation with flowing and sprinkling water, for drawing water from lakes, rivers, wells, or for industrial applications that need to achieve large flow rates at medium-low heads. The pumps must be installed in enclosed places, or at least protected against inclement weather.